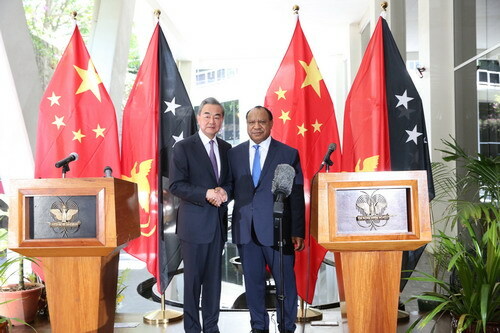 On October 31, 2018, State Councilor and Foreign Minister Wang Yi and Foreign Minister Rimbink Pato of Papua New Guinea jointly met the press after their talks in Port Moresby. A journalist asked Wang Yi's views on some people's claim that China's development poses threats to the island countries. Wang Yi expressed that China's development itself is a just cause in human development and progress as nearly 1.4 billion people have got rid of poverty and moved towards modernization, which is the greatest contribution to all mankind. China's development is the growth of global peaceful forces. China will become the second largest contributor to the United Nations (UN) membership fee before long. China is also the largest contributor to peacekeeping forces among the five permanent members of the UN, and the second largest contributor to the peacekeeping funds in the world. China's development has been playing an important and active role in maintaining world peace and stability. China's development is an integral part of the overall development of developing countries. Every country and every nation in the world has the right to develop. While developed countries taking the lead in developing, developing countries also have the right to seize opportunities to speed up their own development so that their people can live a happy life and this world can become more harmonious and fairer. Any attempt to stop or deprive developing countries of their right to develop themselves is the worst historical injustice and will surely leave a disgraced record in the history. Rimbink Pato noted that China's development has set a good example for Papua New Guinea and other developing countries, and made significant contributions to economic and social development of Papua New Guinea and other Pacific Island countries as well as brought enormous well-being to their people. China's development has never posed any threat to us, and Papua New Guinea expects China to continue playing an important role in the region of the Pacific island countries.